Last week, on Easter, we left the women, or I should say, they left us behind at the tomb, running in terror and amazement and saying nothing to nobody. 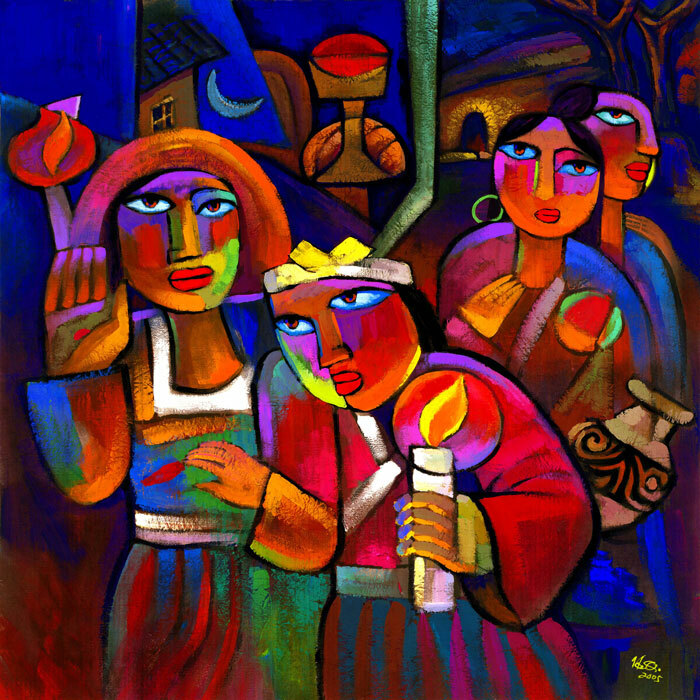 Today’s passage from John’s gospel tells us that that as soon as the Good News of Mary’s Easter message is shared with the disciples—“I have seen the Lord!”—as soon as they hear those words, we are told that they are hiding in a house, curtains drawn, TV and lights off, the doors locked. They are afraid. I get why they were hiding. The Messiah thing had not panned out as they expected them to. Jesus was dead. The religious leaders were looking for his followers. And, even when that blew over, what were they going to tell their old bosses when they went back to them, hat in hand and asked for their jobs back? What had they done wrong? They were good Jewish boys. They followed a good rabbi. They were good people. And now life was collapsing around them. It wasn’t supposed to end like this! And what if Mary was right? If she had actually seen the Lord? Was he like a zombie? A vampire? Had someone else been killed in his place? What did it even mean? They had put his body in a tomb. How did Mary see him in a garden? Wouldn’t you be hiding too? The Good News of Easter, in truth, is a little scary. And it doesn’t get rid of the things in the world that leave us scared. War, violence, economic uncertainties, disease, religious leaders, and spiders, all scare us just as much on this side of Easter as they did before. But as the disciples are huddled behind locked doors, afraid that the religious leaders are after them next, and afraid of everything else, Jesus appears to them. “Peace be with you”, he says. That night, in the darkness of a blacked out room, the Good News of the Resurrection meant that while they could hide from their fears, they couldn’t hide from the peace of God. Their locked doors and their hushed voices didn’t seem to deter the risen Jesus. And just like that, their fear turns to rejoicing. And then he again tells them, “Peace be with you. As the Father sent me, so I send you.” In the midst of the fear, in the midst of the joy, Jesus brings both the peace of God and the sending of God. There isn’t time to hide in locked rooms. There isn’t time to pretend we aren’t home when the world knocks on our door. The command is fairly vague—sent to do what, exactly? But it is also awfully clear—we’re supposed to be like Jesus. We are called out of our locked rooms to be sent into the world as visible signs of God’s love, just as Jesus showed us. So the vague command to be sent by God becomes an all encompassing assignment. Wherever we are, day in and day out, we are there to show people how much God loves them. Jesus breathes the Holy Spirit on them and sends them to share as he had shared. Jesus meets the disciples where they are, and offers them the wounds in his hands and his side. He invites the disciples into the painful places of his own life, or death, as it were. And they come to faith in the presence of the most visible signs of the pain and brokenness of the world—the broken and wounded body of Jesus of Nazareth. So, you can barricade the doors and hide away in fear because of whatever it is that is troubling you, but know this—God will meet you there, breaking through your defenses and bringing you peace. And once we’ve received that peace, that life giving breath of God from the risen Christ, we’re going to be sent to witness to the wounded healer. And God, in the person of Jesus, knows first hand what there is to fear in the world because he bears the marks of the wounds in his hands and in his side. And we’re invited, like the disciples, to see that connection. To remember that we are not alone. 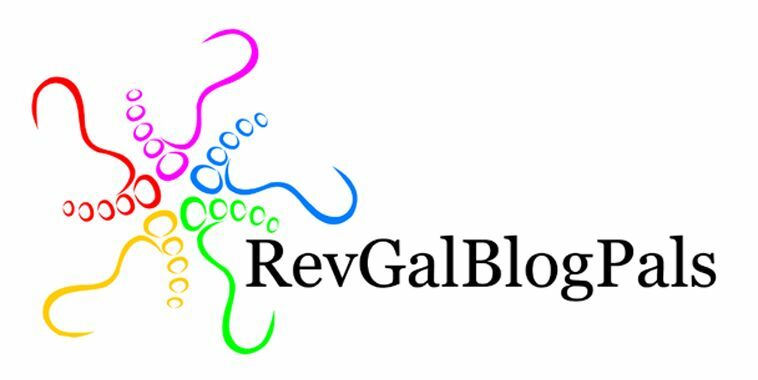 To feel the very breath of God bringing the Holy Spirit and giving us peace. I’m struck by the contrast between how Jesus is sent to the disciples—with wounds and scars and visible signs of pain—and how we, as American Christians want to send Jesus. I don’t know who this artist is or what they were thinking when they painted it. I fear, however, it speaks to the fact that while God shows us a wounded and broken Jesus, we want to show the world a superhero, lone ranger Jesus who doesn’t know pain and weakness. Jesus shows the disciples his broken places and his woundedness. We show the world that to be wounded or broken is to be weak and a failure. Jesus invites the disciples to touch his scars, the evidence of his crucifixion. We invite the world to hide their scars and pull themselves out of their despair and get on with it. Jesus breathes the holy spirit onto the disciples and sends them out to forgive one another. We breathe our privilege and power on the world and claim our special rights at the expense of others. Are we showing the world our wounds? Or are we pretending that, because we are Christians, we don’t have any? Being Easter people mean we are people who serve a God who died. 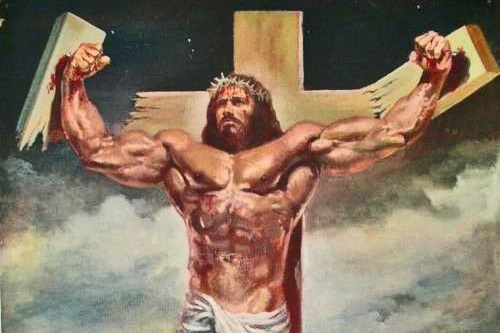 Had Jesus been the superhero muscle-y man in this picture, we would not be Easter people. He would have jumped off the broken cross and gotten into a gunfight with the temple guards. We serve a God who chose to remain on a cross until he died. Really died. After really being wounded and hurt. Yes, we are also resurrection people. But the resurrection came later. And it didn’t erase the wounds. I don’t know when or where you first saw Jesus. I didn’t really get to know Jesus when all was going well. Even though I had grown up going to church and sunday school, it wasn’t until I was in college that I got close enough to him to touch his wounds. Of course, it was only when I went through a difficult and painful year before I knew how badly wounds could hurt. Before I’d been wounded myself, I thought wounds were avoidable, that if you did the right things and lived the right life, that you would be wound free. I’m sure none of my Sunday School teachers had ever said it, but I think I somehow internalized some message that people who went to church and loved God had good and pain-free lives. One day, though, in the midst of the disaster my life seemed to be, I looked around and wanted nothing more than to hide myself away in an upper room. I wanted to be away from people who would say, “oh, so you thought you had all of the answers, did you? How’d that turn out for you?” I wanted to hide from the consequences and the difficulties I knew were ahead. I was afraid I didn’t have what it would take to get through the journey. It was then. At my most vulnerable. My most broken. My most cowardly. I was a wreck because life as I knew it was crashing around me and it was then that Jesus showed up and breathed his peace on me. And showed me his wounds. And reminded me I wasn’t the only person to know pain. And reminded me I wasn’t alone. And gave me his peace so I had the strength to get through each day. I didn’t need a superhero Jesus. That Jesus would have left me feeling inadequate and unworthy. I needed to see his wounds. I needed to know someone else had walked a similar lonesome valley. I needed to know my wounds weren’t the final story—that resurrection was possible, even for me. For me, the power of the risen Christ wasn’t in invincibility as the world understands. It was the power of love and grace that was visible in the wounds of the risen Lord. Wherever we see the pain of the world on the hands and in the sides of God’s children, we are to proclaim that Christ is risen, that God has been where they are. We have seen his hands and have been invited to touch his wounds. Let’s go show that Jesus to the world–wounded, broken, spirit filled, with power to save.